Photograph with permission from St Columba's Hospice, Edinburgh. Welcome to this informative online self-study tool on physiotherapy and rehabilitation in palliative care, intended for allied health professionals. Throughout this continuing professional development (CPD) package, coloured speech bubbles will represent professional opinions obtained via interviews undertaken in November 2013. 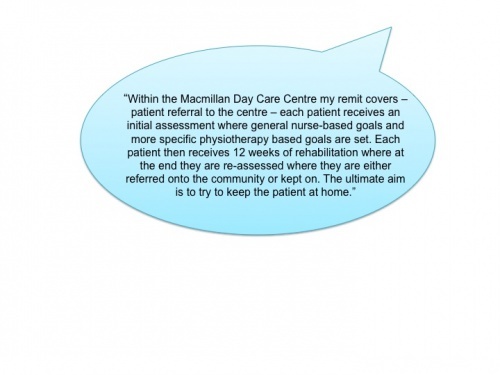 Blue coloured speech bubbles will represent those thoughts and opinions of Mandy Trickett, Macmillan Specialist Physiotherapist & Scottish Representative for Association of Chartered Physiotherapists in Oncology and Palliative Care. Purple coloured speech bubbles will represent thoughts and opinions of Teresa Storr, Locum Consultant in Palliative Care, Cumbria. Product: Online self-study and/or CPD package. 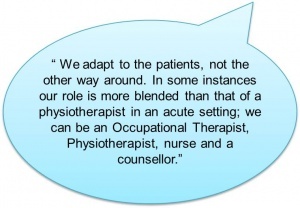 Intended audience: Physiotherapists and other allied health professionals (AHPs). Purpose: To promote the role of physiotherapy in palliative care, while educating AHPs on the benefits and appropriateness of referral. 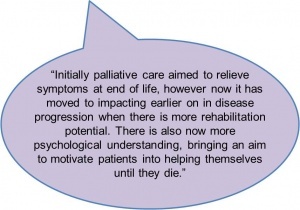 LO1 Develop knowledge and understanding of palliative care. LO2 Recognise and evaluate the role of physiotherapy in palliative care. LO3 Gain knowledge of the evidence surrounding the benefits of palliative care physiotherapy. LO4 Identify the referral of suitable palliative care patients to physiotherapy and be able to apply in clinical practice. LO5 Formulate an awareness of family involvement, regarding compliance to and education about physiotherapy treatment in palliative care. 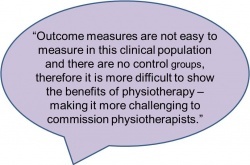 LO6 Appraise the changing demographics and the role of palliative care physiotherapy. Palliative care is a practice discipline, which involves progressive and life-limiting illnesses such a cancer, chronic obstructive pulmonary disease, motor neuron disease and multiple sclerosis, each of which can benefit from the involvement in physiotherapy. Providing pain relief and management of distressing and debilitating symptoms, palliative care improves quality of life (QoL) for patients with a life-limiting illness, and their families. Helping integrate the psychological, social and spiritual aspects of holistic care, palliative care manages patients’ symptoms and pain levels, providing relief from distress and ultimately, facilitating improved function. All patients regardless of their diagnosis, should be able to access palliative care appropriate to their current individual needs, to allow this to happen an integrated approach to palliative care is required. The rise in the number of elderly people, especially those who have little home support, makes palliative care even more vital. People dying from stroke, dementia or multi-system failure and cancers need to be guaranteed the same level of care as those that have a diagnosis of cancer. Palliative care was initially seen as ‘terminal care’. Its scope has recently broadened and the concept of ‘rehabilitation’ in palliative care is becoming more widespread. Pain relief and the control of symptoms are employed where rehabilitation is not appropriate, depending on the stage of the illness. Allied health and rehabilitation in palliative care is well established. Meeting patients’ physical, psychological, social and spiritual needs, palliative care rehabilitation fits the adopted bio-psycho-social approach to health care, suggested by the World Health Organisation.Involving symptom management and treatment effect minimisation in patients with progressive and irreversible illness, this essential service within health care must be utilised where appropriate, improving and maintaining patients’ and their families’ QoL. Physiotherapy aims to maximise movement and function, where threatened by ageing, injury or disease, essential for optimal wellbeing. A detailed explanation of the physiotherapist's role in palliative care can be viewed in section 3. Existing evidence, though in its preliminary stages, advocates the role of physiotherapists and rehabilitation in palliative care. Early referral to palliative care rehabilitation has been linked to higher-functioning patients, therefore appropriate referral to palliative care physiotherapy is critical for optimal and patient-centred care. Referral information and pathways can be viewed in section 4. Despite potential benefits of palliative care physiotherapy, evidence suggests a lack of palliative care patients receiving physiotherapy treatment. As a result, to the detriment of patients and the NHS (National Health Service UK), specialist palliative care teams may be failing to deliver patient-centred care, in failing to refer. Research suggests the reluctance of referral, by other allied health professions, due to the misconceived perception of inappropriateness of terminally ill patients to rehabilitation. In addressing this commonly altered perception of palliative care physiotherapy on a preliminary level, this self-study CPD (continuing professional development) package will demonstrate the vast capability and variability of rehabilitation in such a setting. With palliation, physiotherapy treatment aims to maintain QoL while alleviating stress from symptoms in particular, pain, and effects from treatment. Palliative care physiotherapy has been found to positively influence QoL and perceived wellbeing in a range of palliative care populations, including cancer, HIV, neurological disorders, cardiopulmonary conditions and mental illness. Palliative care physiotherapy specialists demonstrate extensive knowledge and vast experience working with life-limiting illnesses, with competency responding to rapidly changing situations. In response to staggering research on palliative care rehabilitation perceptions and lacking numbers of referral, this self-study package has been designed as an educational resource for all allied health professionals in the United Kingdom (UK). The package aims to void a trough in knowledge, and degree of uncertainty or misconception, surrounding referral of appropriate palliative care patients, to physiotherapy. It is not exclusive to any one palliative care specialty area, but can be adopted for a range of palliative care areas. While providing up-to-date factual information for allied health professionals, this package will endeavour to extend beyond the tangible requirements for referral to physiotherapy in palliative care. It will provide a sound explanation of necessary personal values and the importance of suitable communication skills, for interaction with patients and families in or being referred to palliative care. The ‘Quality Statement and Definition of Specialist Palliative Care’ provided by National Institute for Health and Care Excellence (NICE) states, “Specialist Palliative Care encompasses hospice care as well as a range of other specialist advice, support and care such as that provided by hospital palliative care teams. Specialist palliative care should be available on the basis of need and not diagnosis, offered in a timely way appropriate to their needs and preferences, at any time of day or night." General palliative care is an integral part of the routine care delivered by all health and social care professional to patients living with life-limiting illnesses, whether at home, in a care home or in hospital. Specialist palliative care is based on general palliative care but can help patients with more complex palliative care needs. Specialist palliative care focuses on complex care needs. It is provided by a specially trained multi-disciplinary team (MDT) and can be accessed in any care setting. Within Scotland, palliative care services are provided by the Scottish Partnership for Palliative Care (SPPC). This is the body representing the major organisations involved in palliative care in Scotland, including all 14 Health Boards, all 15 of Scotland’s voluntary hospices, 18 national health charities, 7 professional associations and 1 local support organization. They aim to support the development and strategic direction of palliative care in Scotland and the promotion of service improvement at local level. Most palliative care is received in a hospice (a specialist residential unit), run by an MDT comprising doctors, nurses and therapists. They are smaller and quieter than hospitals and often feel more like a home. Hospices can provide individual care more suited to the patient. Hospice care is palliative in nature, but the illness must have progressed to a point where curative treatment is no longer beneficial; the goal is no longer to cure but to promote comfort. Hospice care focuses on relieving symptoms and offering comfort from pain, shortness of breath, fatigue, nausea, anxiety, insomnia, constipation. Here is a link to Marie Curie Hospices across the United Kingdom. It is possible for the patient to be cared for at home, by hospice staff. The patient’s general practitioner (GP) can arrange for community palliative care nurses, such as Macmillan nurses, to provide this level of care. Patients can remain at home but visit a hospice during the day, allowing them to receive the care and support that they require without the distress often associated with leaving their home. Specialist palliative care teams are available in hospitals; such teams are called Macmillan Support Teams or Symptom Control Team. Their role lies in providing education, training and specialist advice on pain and symptom management to hospital staff with the ultimate aim of enhancing patient care. They also provide emotional support to the patients and families. An example of hospital palliative care in Scotland, is the Beatson West of Scotland Cancer Centre. The community service provides specialist palliative care in the community, with the aim to avoid unplanned admission to hospital for patients who have complex needs but prefer to be care for at home. It is an area in which large growth is proposed for in the future. 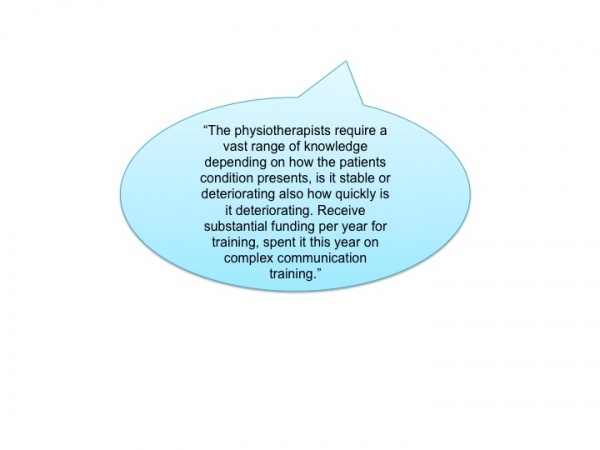 The physiotherapist must consider the patient’s needs and wishes, along with their physical needs  . Each individual will have different needs depending on how well they are handling their life-limiting illness. Robinson  claimed that patients’ needs and priorities must be addressed in order for treatment to be successful. Patients may need education on how to cope and handle the situation as best they can, to lessen the fear and anxiety they have surrounding their condition. Worry and anxiety are two common psychological aspects associated with life-limiting illnesses. The entire MDT, including the physiotherapist may be involved in the control of some of these symptoms, through education, maybe even just empathy towards the patient. Often when diagnosed with such illnesses patients can suffer from depression. This can regularly result in the individual becoming bed bound and inactive. To remain as independent as possible/maximize independence and daily function. To optimize and maintain quality of life (QoL)  – determined by physical functioning and psychological symptoms. Reduction/control of the consequences of the illness . Coping mechanisms and self-management – to be in more control of their lives. To avoid secondary complications associated with life-limiting illnesses. Effective communication is paramount for interaction with patients and families in or being referred to palliative care. Palliative care physiotherapy specialists demonstrate extensive knowledge and vast communication experience working with life-limiting illnesses, with competency responding to rapidly changing situations. Appropriate communication follows the bio-psychosocial model and is a core priority for palliative care services concerned with the psychological and emotional well being of the patient; including issues of self-esteem, insight into and adaptation to the illness and its consequences, communication, social functioning and relationships. In a study by McIlfatrick, the needs identified by patients and their caregivers in palliative care included social support and the provision of practical care, respite care, psychological support, and information and choice. Therefore, knowledge of the patient’s diagnosis and any associated past treatments or conditions, in order to be able to plan the best physiotherapy treatment. In patients with life-limiting illnesses, symptom control and maintenance of function become crucial aspects of treatment. 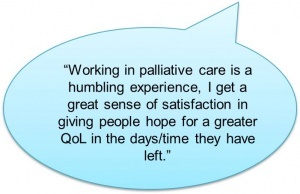 Palliative care aims to improve the QoL in patients faced with life-limiting illnesses. There is a role to be played in pain management and in the relief of other distressing symptoms, Figure 3.1. 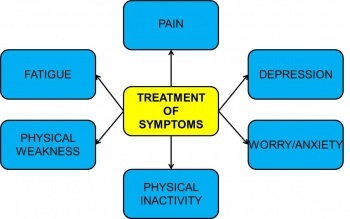 Figure 3.1 Common symptoms experienced by palliative care patients and physiotherapy treatment of these symptoms. Physiotherapists primarily address the physical components of rehabilitation. With life-limiting illnesses, cancer for example, there is also a psychological aspect, which we as physiotherapist may need to also address. The whole needs of the individual must be addressed.There are many forms of treatment that physiotherapists can employ in the management of patients in palliative care. The decision as to what option best suits each patient is quite personal and depends on the stage of the disease process and goals set. Goals are largely dependent on the stage the patient is at. Life prolongation can be a goal in early stage of illness but as the illness progresses the goal can shift to optimising QoL as opposed to prolonging it. Different treatments are suitable for the various phases of illnesses. These different forms of treatment provided by physiotherapists and their suitable phase are displayed in Table 3.1 below. Table 3.1 Physiotherapy treatment and suitable phase during palliation. Pain relief – TENS, heat, massage, lymphedema treatment and acupuncture are common forms of pain relief. Pain relief is often employed where rehabilitation is not appropriate. Passive movements – These are often used in bed bound patients. Physical exercise – This may have a positive effect on depression and is currently emerging as a major aspect of the treatment of patients in palliative care. Soft tissue massage and/or therapeutic massage is used to relieve muscle tension can often aid in easing the symptoms of anxiety. Family/carer involvement is beneficial as it provides an opportunity for education on the delivery of treatments when the physiotherapist is absent. It enables the family/carer to assist in treatments such as transcutaneous electrical nerve stimulation (TENS) to reduce pain. They can also be educated in methods to assist patient during transfers. Inclusion of the family and/or carer into physiotherapy interventions will help to motivate patient to participate in therapy and the patient may find it more comforting and enjoyable as a familiar face will be involved. A range of inter-connected benefits are associated with family and/or carer involvement in physiotherapy treatment, see Figure 3.2. Physiotherapists have a role in providing advice or education to patient and family/carers, enabling them to adjust and adapt to consequences of the illness. Adequate education and counselling to patients and their families, is an integral part of palliative care rehabilitation. 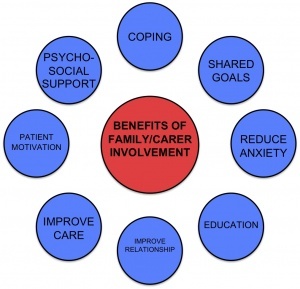 Figure 3.2 Benefits of family and/or carer involvement in physiotherapy treatment. The primary goal of physiotherapy in palliative care is to achieve the best possible QoL for both the patient and their families. As stated previously goals and treatment are highly dependent on the stage of the disease. For example: the focus and goal of ‘traditional’ cancer rehabilitation are different to those of a terminally ill patient where there is a focus on maintaining a balance between optimal functioning levels and comfort. Fatigue and the reduction in physical functioning in life-limiting illnesses is a significant factor in the reduced QoL often seen in these patient groups. Rehabilitation in palliative care is gaining more and more attention in the literature today. It can be difficult to predict, however, which patients will actually benefit from this ‘rehabilitation’ and how long these benefits will be sustained for. In cancer patients, physical activity has been shown to address a decline in physical functioning and cancer-related fatigue (CRF). Most studies to date have researched physical activity and palliative care in early phases of illnesses such as cancer. Limited studies have focused on the ‘end-of-life’ phase. A review of the current literature by Lowe et al. examined physical activity as a supportive care intervention in palliative cancer patients. Encouraging results have been found regarding physical activity interventions and palliative care and the ability of patients to tolerate this physical activity. There is however, a need for more feasible studies to be produced in order to further advance this emerging research in palliative care. Further definition is required as to what patients are able and willing to participate in physical activity and those who are not. Assessment of the needs, interests and preferences of patients prior to developing physical activity interventions is of major importance. The Macmillan Cancer Support's 'Move More' campaign promotes physical activity for palliative care patients during and after treatment. Further evidence supporting the benefits of exercise for patients, can be viewed here. 'Move More' projects have been rolled out across the UK, including the University of Dundee's initiative to encourage cancer survivors to boost physical and mental well-being. Palliative care patients can be referred to exercise classes. Here is an example of a referral form referral form for 'Move More' Dundee, uploaded with the permission of Macmillan Specialist Physiotherapist, Mandy Trickett. Mandy Trickett, Macmillan Specialist Physiotherapist promotes physical activity in palliative care, view Mandy’s contribution to AHPScot Blog here, look for the entry on 16th September 2013. Table 3.2 Patient touch-points and their feelings about physiotherapy at the Macmillan Day Care Unit. Current referrals to palliative care physiotherapy are made largely by nursing staff, with referrals commonly increased by the presence of a physiotherapist. Existing negative beliefs about rehabilitation in palliative care, amongst nursing staff, persist as definite barriers against referral to physiotherapy. Professional and public attitudes about physical therapy goals are also reported to limit referral to physiotherapy in palliative care. With increasing evidence base advocating referral to rehabilitation services in palliative care, there is a clear need for relevant educational tools, and, an exploration of these negative beliefs. The infrequency of physiotherapy existing as a core part of the specialist palliative care teams in the UK is of great concern. Referral pathways need to be viewed as a continuum and considered from the point of view of the person, not the condition. They need to be well ‘signposted’ so that they are easy to navigate for patients, families and staff. Good quality pathways ensure a timely, smooth and co-ordinated journey across the whole system and a better experience for all. They support care that is safer, more efficient and effective making it easier for us to do the right thing. Early referral to physiotherapy is advisable to ensure early implementation of rehabilitation goals, especially those who are preventative or restorative. Complex physical, psychological, spiritual or family needs that cannot be met by the staff in that care setting. The Palliative Care Guidelines Pocket Edition 2010  for NHS Lothian, Scotland, can be downloaded here. You can also view the Specialist Palliative Care Referral Form  for NHS Lothian, Scotland, here for your reference. 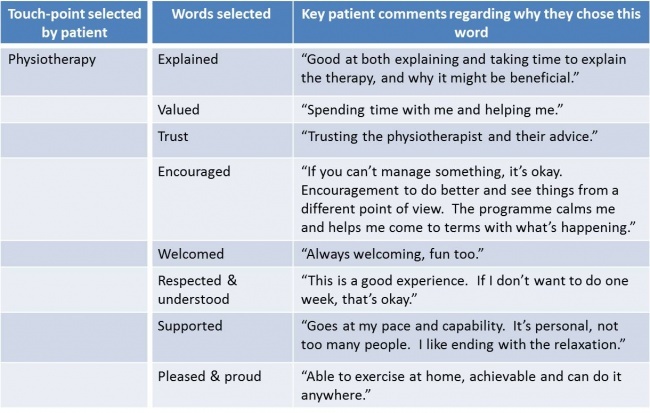 Physiotherapy objectives within each of the palliative care settings differ depending on what stage the patient is at. Some may be actively dying; the physiotherapy input here is based on positioning and respiratory care. 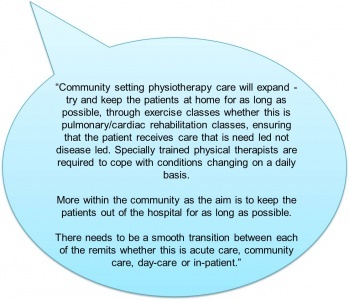 Longer-term patients’ physiotherapy looks at maximising quality of life and maintaining mobility and independence. It is not possible to predict the timescale of individual prognosis accurately so evidence informed, clinical reasoning is used to identify people who may benefit from supportive and palliative care. Clinical indicators can help identify patients who are candidates for assessment to see if they have unmet needs (Supportive and Palliative Care Indicators Tool- SPICT). A patient can be discharged from the hospice once they no longer require palliative care, but can return at anytime if their condition changes. The pattern of referral to palliative care has altered over the past 10 years. Initially hospice outreach was chiefly to the community and as such most referrals arose from GPs. This pattern has changed; acute trust referrals now exceed GP referrals. This trend is likely to continue both for in-patient care and for home support after hospital discharge. However patients must be referred to a hospice through their GP, hospital doctor or district nurse. There appears to be a lack of consensus within the available literature regarding a standardised referral process into palliative care physiotherapy. There are some settings within Scotland and the UK that provide the level of care which ensures high QoL for patients’ right up until the terminal stage of the disease process. However this feeling of hope which coincides with control over disease manifestations is not apparent for all patients and even more concerning is in some instances the level of care available is a case of a postcode lottery. The points of transition from long-term condition management to palliative care and end of life are poorly defined and recognized. There is a risk that patients may not receive appropriate care. The future direction of palliative care is set to extend to accommodate the changing demographics of the population. With more elderly patients, the burden of existing co-morbid conditions will increase, therefore rehabilitation will require to be more invasive and last longer. In conjunction with this, the length of in-patient or home care attachment may increase. This will put extra burden on a setting that is currently low on resources. In addition with decreasing morbidity associated with cancer, it is expected that fewer patients will die from cancer but more patients will be involved with palliative care for other conditions. Q1. 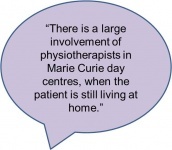 To what extent is physiotherapy offered throughout the settings of palliative care? Q2. How is a referral to physiotherapy in palliative care made? Q3. What are the main interventions used in palliative care physiotherapy and how do these aim to help the patient? Q4. 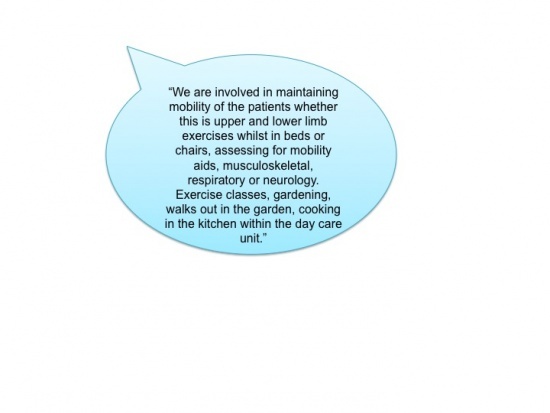 What are the benefits of patient family/carer involvement in their physiotherapy? Q5. 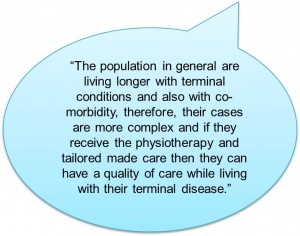 In what way do think palliative care physiotherapy will develop in the future? 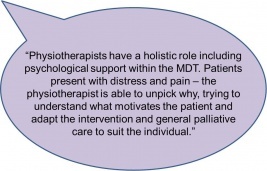 Synthesise what you now understand the role of physiotherapy to be in palliative care, and how this will contribute to the holistic care of patients both now and in the future. ↑ World Health Organization. New guide on palliative care services for people living with advanced cancer. 2007. Full version: http://www.who.int/mediacentre/news/notes/2007/np31/en/ (accessed 28 Oct 2013). ↑ 2.0 2.1 2.2 2.3 2.4 2.5 NHS Choices. Accessing palliative care. 2012. Full version: http://www.nhs.uk/CarersDirect/guide/bereavement/Pages/Accessingpalliativecare.aspx (accessed 30 Oct 2013). ↑ 3.0 3.1 Prevost V, Grach MC. Nutritional support and quality of life in cancer patients undergoing palliative care.European Journal of Cancer Care 2012; April 21 (5): 581-590. ↑ 4.0 4.1 4.2 4.3 Mcilfatrick S. Assessing palliative care needs: views of patients, informal carers and healthcare professionals. Journal of Advanced Nursing 2007; 57(1) 77-86. ↑ Higginson I, Wade A, McCarthy M. Palliative care: views of patients and their families. British Medical Journal 1990; August 301(6746): 277-281 Full version: http://www.ncbi.nlm.nih.gov/pmc/articles/PMC1663479/ (accessed 10 Oct 2013). ↑ Scialla S, Cole R, Scialla T, Bednarz L, Scheerer J. Rehabilitation for elderly patients with cancer asthenia: making a transition to palliative care. Palliative medicine 2000:14:(2):121-127. ↑ 7.0 7.1 7.2 Horne-Thompson A, Bramley R. The benefits of interdisciplinary practice in a palliative care setting: a music therapy and physiotherapy pilot project. Progress in Palliative Care 2011; 19(6): 304-308. ↑ World Health Organization.International Classification of Functioning, Disability and Health (ICF). 2002. Full version:http://www.who.int/classifications/icf/training/icfbeginnersguide.pdf (accessed 26 Oct 2013). ↑ 9.0 9.1 9.2 9.3 9.4 9.5 9.6 9.7 9.8 9.9 Cobbe S, Nugent K, Real S, Slattery S, Lynch M. A profile of hospice-at-home physiotherapy for community-dwelling palliative care patients. International Journal of Palliative Nursing 2013; 19(1): 39-45. ↑ 10.0 10.1 Kumar SP, Jim A. Physical Therapy in Palliative Care: From Symptom Control to Quality of Life: A Critical Review. Indian Journal of Palliative Care 2010; 16(3): 138-146. ↑ 11.0 11.1 11.2 Nelson LA, Hasson F, Kernohan WG. Exploring district nurses' reluctance to refer palliative care patients for physiotherapy. International Journal of Palliative Nursing 2012; 18(4):163-170. ↑ 12.0 12.1 Parliament UK.Appendix 29: Memorandum by the Chartered Society of Physiotherapy (PC 37)2004. Full version: http://www.publications.parliament.uk/pa/cm200304/cmselect/cmhealth/454/454we34.htm (accessed 29 Oct 2013). ↑ 13.0 13.1 Pitman S. Evaluating a self-directed palliative care learning package for rural aged care workers: a pilot study.International Journal of Palliative Nursing 2013; 19(6): 290-294. ↑ National Institute for Healthand Care Excellence. Specialist Palliative Care. 2011. Full version: http://www.nice.org.uk/guidance/qualitystandards/endoflifecare/SpecialistPalliativeCare.jsp (accessed 17 Oct 2013). ↑ Chartered Society of Physiotherapy.A flowering vacation.2012. Full version: http://www.csp.org.uk/frontline/article/flowering-vocation(accessed 16 Oct 2013). ↑ 16.0 16.1 16.2 The National Council for Palliative Care. Palliative Care explained. 2012. Full version: http://www.ncpc.org.uk/palliative-care-explained (accessed 16 Oct 2013). ↑ Scottish Partnershipfor Palliative Care. What is Palliative Care? 2012. Full version: http://www.ncpc.org.uk/scotland (accessed 16 Oct 2013). ↑ 20.0 20.1 Marie Curie Cancer Care. Marie Curie Hospices.2013. Full version: http://www.mariecurie.org.uk/en-gb/Commissioners-and-referrers/Referring-patients/Marie-Curie-Hospices/ (accessed 16 Oct 2013). ↑ Robinson S. The learning needs of cancer patients. European Journal of Cancer Care 1992; 1(3): 18-20. ↑ 23.0 23.1 23.2 23.3 23.4 Bancroft MI. Physiotherapy in cancer rehabilitation: a theoretical approach. Physiotherapy 2003; 89(12):729-733. ↑ Martlew B. What do you let the patient tell you? Physiotherapy 1996;82(10): 558-565. ↑ Association of Chartered Physiotherapists in Oncology and Palliative Care. 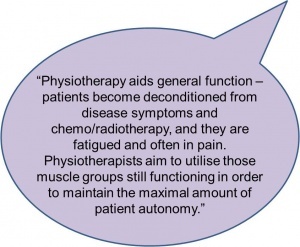 The role of physiotherapy in oncology and palliative care. 2009. Full version: http://www.acpopc.org.uk/acpopc/Young%20A5%20leaflet_Jun09%20b%20ref.pdf (accessed 16 October 2013). ↑ Bradley SE, Frizelle D, Johnson M. Coping with Terminal Illness: The Experience of Attending Specialist Palliative Day Care. Journal of palliative medicine 2010;13(10):1211-1218. ↑ 27.0 27.1 27.2 Santiago‐Palma J, Payne R. Palliative care and rehabilitation. Cancer 2001; 92(Suppl 4): 1049-1052. ↑ Oldervoll LM, Loge JH, Paltiel H, Asp MB, Vidvei U, Wiken AN, Hjermstad MJ, Kaasa S. The Effect of a Physical Exercise Program in Palliative Care: A Phase II Study. Journal of Pain and Symptom Management 2006; 31 (5): 421-430. ↑ 29.0 29.1 29.2 29.3 29.4 Lowe SS, Watanabe SM, Baracos VE, Courneya KS. Associations between physical activity and quality of life in cancer patients receiving palliative care: A Pilot Survey. Journal of Pain and Symptom Management 2009; 38(5):785-796. ↑ Pollak KI, Childers JW, Arnold RM. Applying Motivational Interviewing Techniques to Palliative Care Communication.Journal of Palliative Medicine 2011; May 14(5): 587–592. Full version: http://www.ncbi.nlm.nih.gov/pmc/articles/PMC3089740/ (accessed 25 Oct 2013). ↑ 31.0 31.1 31.2 Montagnini M, Lodhi M, Born W. The utilization of physical therapy in a palliative care unit. Journal of Palliative Medicine 2003; 6(1): 11-17. ↑ Kumar SP, Jim A. Physical Therapy in Palliative Care: From Symptom Control to Quality of Life: A Critical Review. Indian Journal of Palliative Care 2010; 16(3): 138-146. ↑ Parliament UK.Appendix 29: Memorandum by the Chartered Society of Physiotherapy (PC 37)2004. Full version: http://www.publications.parliament.uk/pa/cm200304/cmselect/cmhealth/454/454we34.htm (accessed 29 Oct 2013). ↑ 34.0 34.1 The Scottish Government Health Delivery Directorate Improvementand Support Team. Long term conditions collaborative: Improving care pathways. 2010.Edinburgh: Scottish Government. Full version: http://www.scotland.gov.uk/Resource/Doc/309257/0097421.pdf (accessed 17 Oct 2013). ↑ 35.0 35.1 Chartered Society of Physiotherapy.The remains of the day. 2008. Full version: http://www.csp.org.uk/frontline/article/remains-day (accessed 16 Oct 2013). ↑ 36.0 36.1 NHS Lothian, Palliative Care Guidelines: Pocket Edition 2010, 3rd ed.|Version 2. http://www.palliativecareguidelines.scot.nhs.uk/documents/MASTER%20Lothian%20pocket%20guide.pdf (accessed 20 Nov 2013). ↑ NHS Lothian, Lothian Specialist Palliative Care Services Referral Form. http://www.nhslothian.scot.nhs.uk/Services/A-Z/PalliativeCare/Documents/SpecialistPalliativeCareReferralForm.pdf (accessed 20 Nov 2013). ↑ NHS Lothian. Supportive and Palliative Care Indicators Tool (SPICTTM). 2012. Full version: http://www.palliativecareguidelines.scot.nhs.uk/documents/SPICT_Sept2012.pdffckLR(accessed 27 October 2013). ↑ 39.0 39.1 The Scottish Government.Cancer scenarios: An aid to planning cancer services in Scotland in the next decade- Implications for palliative care.2001; 330-335. Full version: http://www.sehd.scot.nhs.uk/publications/csatp/csatp.pdf (accessed 17 Oct 2013). ↑ NHS Choices. End of Life Issues. 2012b. Full version: http://www.nhs.uk/Carersdirect/guide/bereavement/Pages/Accessingpalliativecare.aspx (accessed 16 Oct 2013). Role of Physical Therapy Intervention in Patients With Life-Threatening Illnesses.